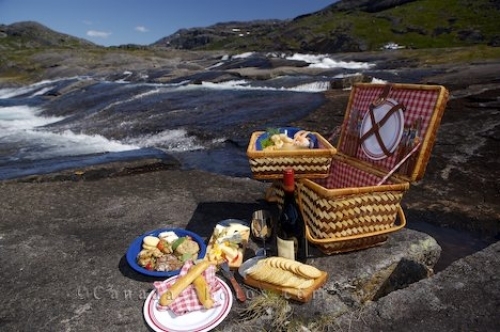 Atop the Mealy Mountains in Southern Labrador, Canada, meals are important and what better way to enjoy lunch than to sit beside a waterfall with a picnic basket full of food. In the background, a helicopter waits for its passengers as they enjoy a picnic atop the Mealy Mountains in Southern Labrador, Canada surrounded by a beautiful waterfall in the mountain wilderness. An assortment of food, a bottle of wine, clean fresh air with the sounds of the water rushing past you is what a real picnic is all about. Picture of a food basket laid out on the rocks beside a waterfall atop the Mealy Mountains in Southern Labrador, Canada.